General entry: Rs. 350/- per-person. Group entry: Rs. 300/- per-person. 2017-12-31 07:00:00 2017-12-31 10:00:00 Asia/Kolkata અાવવું છે? 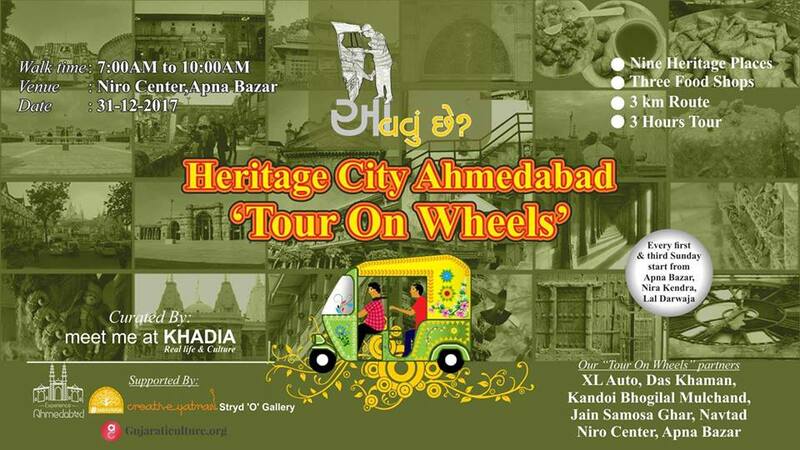 Heritage City Ahmedabad "Tour On Wheels"
We will show you Ahmedabad with the ride in an auto rickshaw. This is unique rickshaw tour, in which you can enjoy the eating of food at famous food shops of Ahmedabad, along with Ahmedabad’s heritage. This tour will cover main heritage places of heritage city of Ahmedabad. Take a walk down towards various food zones of The City of Joys and you won’t be disappointed. There is no love more sincere than the love for food and a visit to Amdavad is incomplete without an introduction to traditional Gujarati food. On this tour, you will be able to explore some of old Amdavad’s historical heritage places and sweet shops. Also, you will get exposed to a variety of old food shops, operating since more than 70 years in the walled city. Get enriched by listening to the legendary stories of their founders.